The Trump administration has announced that Americans can sue foreign companies that do business in Cuba on property there seized from Americans. The move marks a sharp change in US policy towards Cuba and has been opposed by Canada and European countries which have threatened to sue. 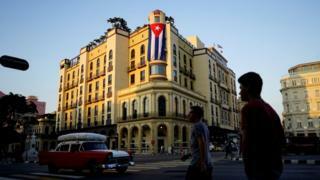 It is seen as an effort to stem investment in Cuba for its support of Venezuelan President Nicolas Maduro. The 1959 Cuban Revolution has led to years of US trade restrictions on Cuba. The policy change was announced during a speech given in Miami by National Security Adviser John Bolton to commemorate the 58th anniversary of the failed US-backed efforts to invade Cuba through the Bay of Pigs. "Americans who have had their private and hard-earned property stolen in Cuba will finally be allowed to sue," Mr Bolton said on Wednesday. He described the new initiative as "undoing the damage" of the Obama administration, which sought to normalise diplomatic and economic relations with Cuba. "Under this administration, we don't throw dictators lifelines," Mr Bolton said. "We take them away." 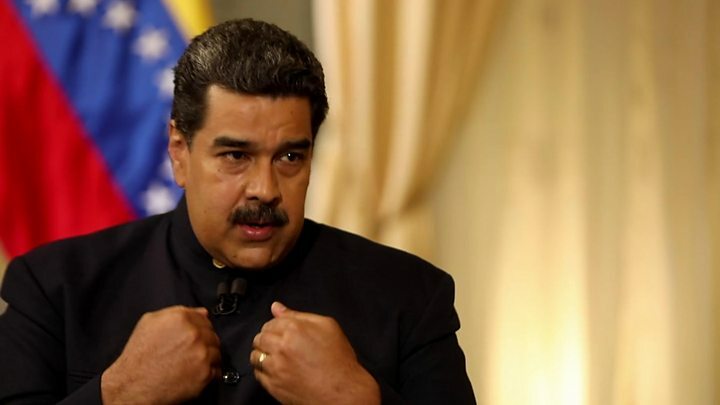 In a speech in Miami last year Mr Bolton referred to Venezuela, Cuba, and Nicaragua as a "troika of tyranny" and said their governments illustrate the results of "the perils of poisonous ideologies left unchecked". The US accuses Cuba of sending thousands of troops to Venezuela in order to prop up the regime of embattled president Nicholás Maduro. The change stems from the Helms-Burton Act, passed by Congress in 1996. A provision of that law had repeatedly been suspended by the previous three US presidents. Permitting this provision, called Title III, means that Americans whose property was seized following the Cuban Revolution can now sue companies that are accused of having benefited - or having "trafficked" - in that property. Those properties are believed to include beachfront homes, ports operated by cruise ship companies and many other investments associated with the tourism sector as well as several other industries. Mr Bolton also said on Wednesday that anyone who traffics in property stolen from Americans will not be issued a visa to the United States. The European Union has warned that any litigation against foreign companies will likely be met with counter lawsuits, and vowed to bring the US to the World Trade Organisation to solve the dispute. "We believe that the issue of outstanding US claims should not be conflated with the cause of furthering democracy and human rights in Cuba, or by our shared desire urgently to find a peaceful and democratic solution to the crisis in Venezuela," European Commission foreign policy chief Federica Mogherini and European Trade Commissioner Cecilia Malmström wrote in a 10 April letter to US Secretary of State Mike Pompeo. Canada's Minister of Foreign Affairs Chrystia Freeland said in a statement on Wednesday that "Canada is deeply disappointed with today's announcement. We will be reviewing all options in response to this US decision". She added that she had spoken to Canadian businesses "to reaffirm we will fully defend the interests of Canadians conducting legitimate trade and investment with Cuba". Johana Tablada, Cuba's deputy director of US affairs wrote on Twitter: "Before they try to euphorically ride a wave of wickedness and lies, they should take a dose of reality. The world has told John Bolton and the US government to eliminate the criminal blockade against Cuba and the Helms-Burton Act." Critics note that some of the "trafficked" properties have changed hands many times since they were originally nationalised in the six decades since the revolution which brought Fidel Castro to power. People who fled Cuba, and later became American citizens, will also be permitted to file lawsuits under the new policy. Despite President's Obama's lifting of some trade and travel restrictions between the two nations, a trade embargo continues to be in place and can only be lifted by the US Congress. The EU's ambassador to Cuba, Alberto Navarro told the Associated Press: "The extraterritorial application of the US embargo is illegal and violates international law." In addition to change to the Helms-Burton Act, Mr Bolton announced several other changes to US-Cuba policy. New restrictions to non-family travel to Cuba - called "veiled tourism" - will be issued, as well as new limits on remittances to Cuba. Mr Bolton also announced additional sanctions on Venezuela's central bank and on Nicaragua's Bancorp bank and on Laureano Ortega, a son of President Daniel Ortega. In his remarks he also warned that "all external actors, including Russia" must not take "provocative actions" in support of Mr Maduro.